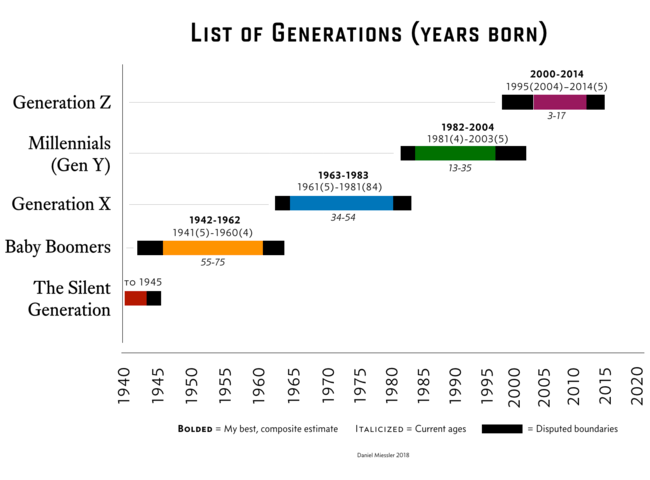 Finding information on the various U.S. generations (boomer, millennial, x, z, etc.) is non-trivial. I end up Googling 37 different sites—all of which disagree somewhat with each other—and then I eventually give up and pick a set of numbers for that particular piece—which I then forget the next time. Plus there aren’t really (m)any good visualizations of these ranges, which are uniquely helpful for this. So I made a reference myself that I’ll use from now on and will try to keep updated. These ranges aren’t perfect, and they aren’t fully agreed upon by experts anyway. I mostly used Wikipedia’s numbers, but also factored in a number of other sites to end up at a middle-ground. The black bars are the disputed edges. The bolded range is what I’m calling authoritative (my own line in the sand). And the italics indicate the range of ages of people living today in that generation. The Strauss-Howe Generational Theory is used as a source for a lot of generational estimates. This is Wikipedia’s article on the generations in the workplace. The biggest fallacy right now regarding generations is that most people over 30 think that everyone young is a millennial. They’re not. Millennials ended around 2004, so if someone is 12 or younger they’re actually Generation Z. There is trouble with the transition between Millennials and Generation Z around year 2000 in that there’s lots of overlap. I’d argue too much to survive. I wouldn’t be surprised if 2000 became the actual transition point in the future, since it’s already considered mid-nineties to mid 2000’s.